I can remember numbers, text, where I’ve put things but I’ve always found memorising music very difficult. Even as a child I always played from music, even in concerts. It’s not my age – though I am 83 – it was the same when I was young. The Sarabande from the Handel suite is easy enough but I’d have to make a real effort to get it by heart. 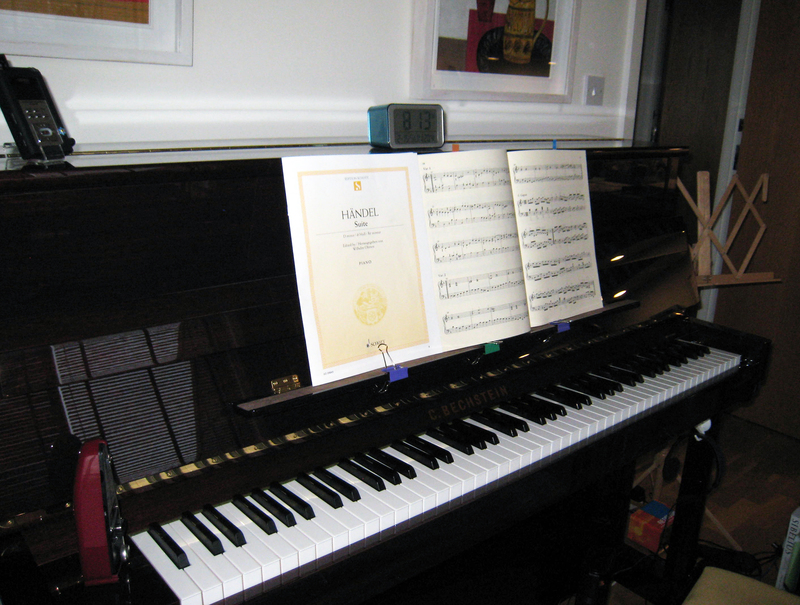 One piece stuck, though, Satie’s Gymnopoedie No 1. I didn’t try to learn it. it was just there. I am trying to memorise Grieg’s Album Leaf. It’s quite a simple piece – two repeated sections, one with the melody in the right hand and one with the melody in the left. I think I’ve managed the first part, but it’s been hard work. What’s so silly, is that I’ve always had trouble not remembering things, especially numbers. I learned to play in 1942 when I was evacuated to Dawlish. My first teacher was a wonderful man, the organist at a local church. I knocked on the door of the room where the piano had been delivered the week before. The smell of cigarettes and mothballs greeted me as I pushed open the door. A short bald-headed man, wearing a rumpled dark grey pin-striped suit, stood by the piano. His waistcoat was tightly stretched across his paunch, a silver watch chain hanging between the pockets. His steel‑rimmed glasses were perched on the end of his nose and held together with sticky tape. On the top of his forehead, he had a round swelling, about the size of a plum. It was hard not to stare at it. He flicked open his pocket watch.